Chapped hands are one of my biggest frustrations while traveling. I hate that I have to lug around an entire 3 oz (100 ml) bottle of hand cream just to keep my hands from getting cracked and bloody. Fortunately, I’ve found that solid lotion bars are a great alternative to creams. They are definitely worth space in the toilet kit. Lotion bars, unlike regular hand lotion, are solid. They usually have bees wax as a base and contain shea butter and other natural oils. Different lotion bars have different combinations of ingredients. Bars that contain high amounts of shea butter are usually softer, easier to apply, and melt at a lower temperature. 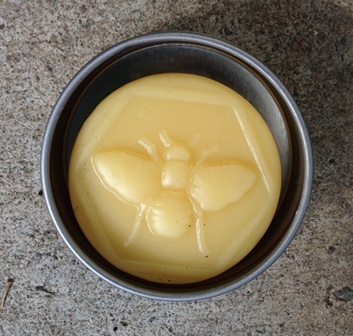 Bars that have a high amount of bees wax are harder, more robust, and take more work to massage into the skin. Bees wax is waterproof, so it actually seals in the moisture of your skin. Apply the bar after a shower when your skin is moist and soft. The wax coating of the bar will trap the moisture, letting it nourish your skin . The waterproof qualities also mean that the lotion won’t wash off. One application will survive multiple hand washings, or even immersion. It will last several hours. Less product is required for each trip, since each application lasts multiple hours. The lotion bar is solid. That means you don’t have to pack it in the liquids bag. The bar won’t leak. It also means that the product is concentrated – a small amount goes a long way. The lotion stays where you put it. It won’t come off on your clothing or on the sheets. Lotion bars are a little tricky to use. Warm the bar by holding it between your hands or against the target area of your skin. Wait a few seconds and rub the bar over the treatment area. Then massage the residue into the skin. It will feel a little sticky at first, but the skin will eventually absorb all of the product. So how do lotion bars work in real life? Here is my experience with two different products – Lush Tiny Hands, and Honey House Bee Bar. The Lush Tiny Hands lotion bar was an impulse purchase. I was in the Lush store, saw that they had a solid lotion bar, and decided to try it. Lush has a reputation for products with strong, sometimes overwhelming perfume smells. This product was no exception and I was concerned that I might not tolerate it. The product is about the size of a hockey puck, placing it on the larger side of travel products. It does not come with any travel-sized container. 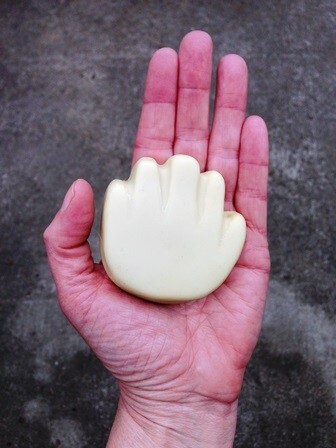 Lush “Tiny Hands” comes in a 2.1 oz (60 g) size. It definitely works if you can handle the overwhelming perfume smell. The bar has a high percentage of shea butter, which means it melts at a low temperature and slides on easily. I tested the bar in three places – on my hands, on my shins, and on my heels. My skin absorbed the product readily and I was very pleased with how it felt. Unfortunately, my concerns about the smell were justified. After a few hours I was getting nauseated from the perfume. I tried washing the product off but alas! The waterproof properties manifested themselves. I was stuck until the lotion wore off. Overall, the product worked well. I just couldn’t stand the smell. I threw the bar out on the back step thinking that it might air-out and I could get rid of the perfume. That’s when this bars weakness manifested itself. Oops. This is what happened when I left the Lush bar out on the back steps to “de-stink”. It was a 65 F day (18 C) and the bar was in direct sun for 4 hours. I’m glad it wasn’t in my toilet kit on a hot trip across the savannah! I left the bar sitting on the back step. It was merely a warm (not hot) spring day. I returned to find a puddle on the step. The bar had completely melted! It had changed color from a mint green to yellow. The different oils had separated out. I’m just glad that the bar wasn’t inside my toilet kit when it melted. I salvaged the bar by pouring it into a soap mold, stirring up the oil, and placing the bar in the freezer. After the bar had re-solidified I popped it out of the mold. The bar stayed yellow but I could continue using it. It moisturized well. Unfortunately the strong perfume smell stayed. I still use the bar but only on my feet. I don’t feel badly about perfuming my shoes. Conclusion: This bar works well as a moisturizer, but fails as a travel product due to its low melting temperature and overwhelming smell. Tiny Hands is available from Lush. The Honey House Bee Bar was a targeted purchase. I had seen the bar on the internet and I really wanted to try it out. Since it comes in seven different scents, I decided that an in-store purchase might be prudent. I wanted a scent that worked for me. Finding a brick and mortar store that carried the bars proved to be a challenge. This is clearly a specialty item and only a few stores carried the bar. Although the Honey House website lists providers, I found out that not all stores carried the product – phone first! I finally found a small ladies shop that carried both the large and small bars. I was interested in the small bar as I intended to use this in my toilet kit as a substitute for lotion. The first thing I noticed was that the bars smelled lovely. All seven scents have a gentle smell to them. I loved both the Honey and the Citrus scents, but finally settled on Natural (for my toilet kit) and Spring Meadow (for my purse). All bars come in their own travel tin. The small bars are 0.6 oz (17 g). They are about one third the size of the tiny hands bars, but still sufficient for a multi-week trip. These bars are harder to apply as they contain a higher percentage of bees wax. I had to hold the bar in my hands for several seconds to warm it up. The lotion went on my hands and feet without problem. 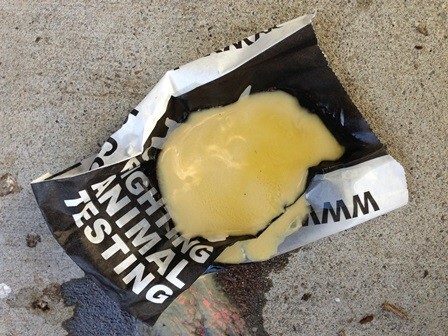 I noticed that the product felt sticky at first, but this disappeared after a minute as it melted into my skin. The product stayed on my hands through several hours and multiple washings. I was extremely pleased with how it worked. My skin felt smooth and soft. The Honey House Bee Bar comes in 7 delicate fragrances. The small sized bar is 0.6 oz (17 g) and includes a travel tin. I decided to subject the Bee Bar to so the same hard conditions as the Tiny Hands product. How would the bar perform in direct sunlight? Would it become a travel mess too? I placed the Bee Bar in its tin out on the back steps. I thought that this might be a harsher test as the metallic tin would conduct heat into the bar. I was pleased with what happened. Or should I say what didn’t happen. After 4 hours in the sunlight the Bee Bar only glistened with oil. No meltdowns, no puddles. The Bee Bar wins! The Bee Bar survives 4 hours in the sun with merely a glisten of oil. This is a travel worthy product. I have continued to use the Bee Bar for multiple weeks and I’m quite pleased with its performance. I love the fact that I only have to apply lotion 2-3 times a day instead of after every wash. My skin looks great and I’ve solved another travel problem. 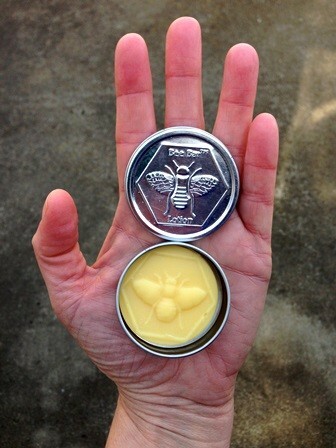 The Bee Bar is available from Honey House Naturals. They are currently having a 20% off spring special until March 31 2014. The sale includes scents that are not normally part of the Bee Bar line. Shipping is free for all orders over $39 US. Use coupon code Spring4me. Disclosure: I paid for all of the products out of my own pocket. I was looking online for solid bar shampoo products and ran across a link to Amazon.com for a product called Woody’s Hair and Body bar. There was also a Woody’s Lotion bar. Have you or any of your readers tried these products? I would really like to be able to leave liquid shampoo and lotion out of my carry on bag!